Aside from a whole month of Christmas music, one of the best parts about December is getting to binge watch all of our favorite holiday movies. Growing up, A Christmas Story and National Lampoon's Christmas Vacation were an annual tradition in my household, but over the years, my list of faves has expanded to include Home Alone, The Grinch, Elf, You've Got Mail, Just Friends, and a few others. 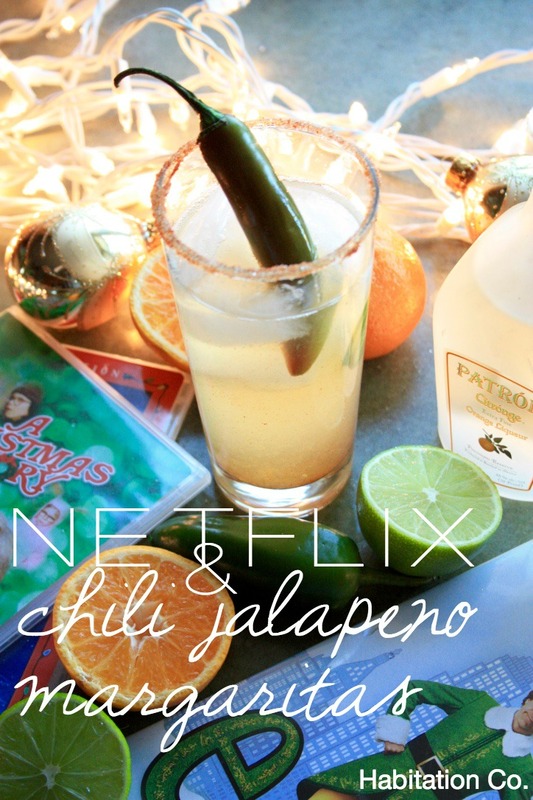 The best part is that most of these movies are just a click of a remote away, so plan a night to order delivery, mix up a few of these tasty chili jalapeno margaritas, and just chill, this season! In a shaker, combine tequila, citrus liqueur, juice, dash of cayenne with ice. Mix a pinch of cayenne pepper into salt for rim. Rim glasses with lime juice and salt. Add liquid, then jalapeno slices, fill with ice, garnish with whole serrano chili. The holiday season is certainly a time of indulgence with sweet treats tempting us at every turn, but if you're like me, I typically prefer salty or savory flavors, even when it comes to my cocktails. Although I'm mostly a red-wine girl at home, every once in a while, I'll get a craving for a classic dirty vodka martini if we're out. The salty olive juice (the "dirty") and the chilled vodka are fine, but add some fresh blue-cheese stuffed olives and I'm all set. If you're looking for an alternative to super-sweet cocktails this season, try your hand at a dirty martini. You'll probably get a few firm eye-handshakes from strangers at the bar, plus this simple recipe is fool-proof, so you can show off your mixologist skills with confidence at your next holiday get-together. Stay tuned for weekly holiday-inspired cocktail recipes all month long! Cheers! Swirl vermouth in empty chilled glass. Shake vodka with ice to chill. Pour into chilled glass. Add splash of olive juice to taste, and blue cheese olives to garnish. Enjoy!